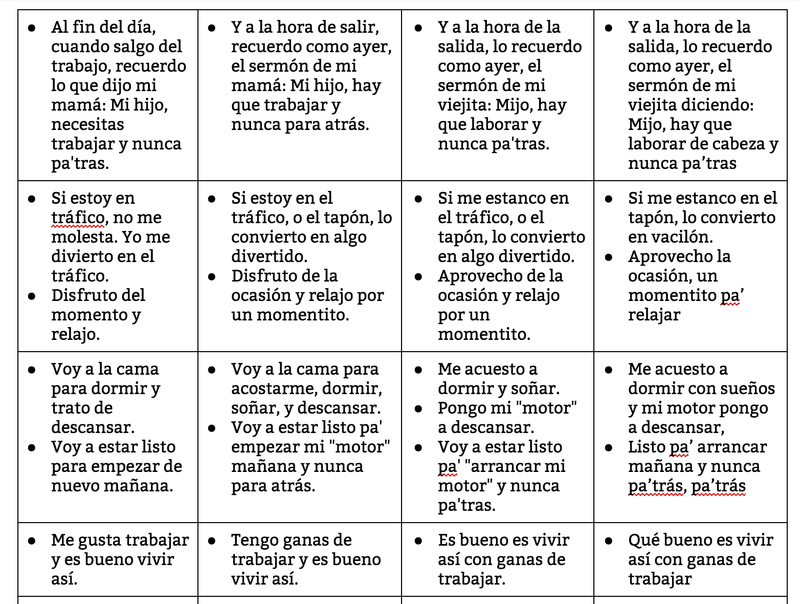 Listen to this episode of Radio Ambulante, en español so it is also great PD! Watch this segment of John Oliver (in English with some swears), with a Lin Manuel Miranda appearance and special rap at the end! Check out what the Puerto Rican organization called "Echar Pa'lante" is doing in Puerto Rico. The slideshow below (click here if you want to make a copy and adapt) will help guide me through the unit. And this unit packet explains the objectives of the unit (in a format that I have to do for the course that I am taking) and has a variety of activities that students will be doing. One of the essential parts of the unit is the song and video "Echar Pa'lante" (which is actually a remake of the song "No hago más na'"). 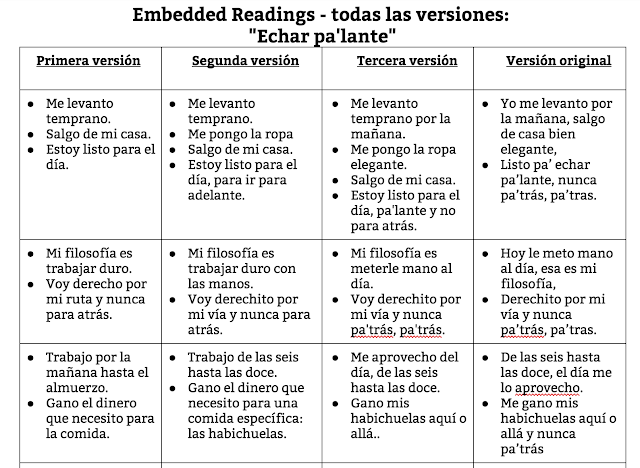 Below the video is a screenshot of the embedded reading that I made so that students can understand the song. 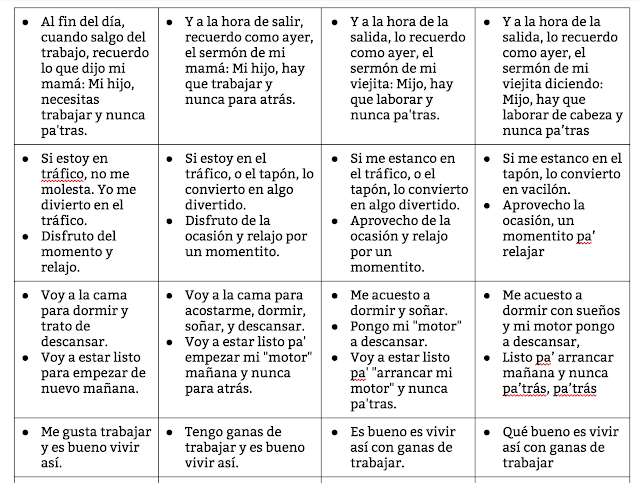 I also created some activities for students to do with those readings (see pages 9-15 of unit packet). There are a variety of other activities in the unit packet, including: essential questions, possible evaluations, prefabricated notes for students to fill in as I explain things to them, two quizlet live links to review and learn about Puerto Rico, a list of professions shown in the video, four embedded reading activities, a cierto/falso activity about one of the embedded reading, questions related to the song and students' own daily lives and beliefs, and a rubric for the evaluación escrita at the end of the unit. Thank you for this inspiration, Kara! I have long wanted to teach about Puerto Rico and also visit, but I have yet to do so. I've fallen in a rut somewhat this semester, and I'm hoping to use what you have here in the future. Thank you for being so inspiring and for so generously sharing. Keep up the great work, amiga! Kara, Puerto Rico is my homeland. I was born and raised there. There are two songs that represent thisisland very well: Patria, by Obie Bermudez and Pedro Capo, and Verde Liz...among many many others. I can definitely answer any questions you may have. I can also recommend places for you to go to while there. My island is my passion. Enid, thanks so much for the song recommendations! I will have to check them out and possibly add them here. And, yes, any recommendations for places to go, *please* send them my way! We are staying Sat.-Fri. in April, so we have a nice chunk of time. We are staying in Isla Verde and will probably rent a car for a few days. Some places we are planning are: Old San Juan (probably on a tour), El Yunque, and the bioluminescent bay. Also, maybe those massive caves. I will send you an email. You just made my heart flood with joy with your post.